According to the World English Dictionary, “buttermilk is the sourish liquid remaining after butter has been churned and separated from milk. It is often used for making scones and soda bread.” Buttermilk is traditionally, a by-product of butter making. 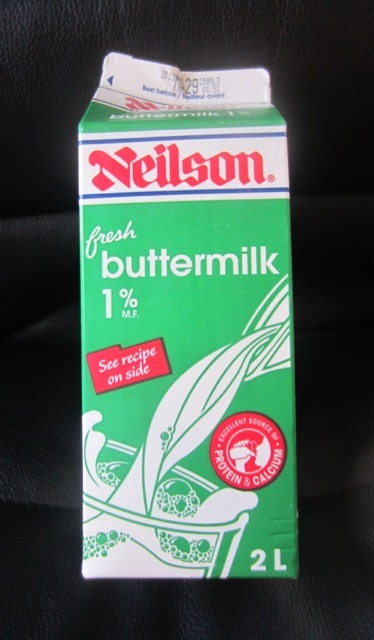 Nowadays, it’s very difficult to get the traditional buttermilk described above, especially in North America, although it’s still common in many Indo-Pakistani households. Most, if not all, of the buttermilk we buy in North America is commercially cultured by adding bacterial culture to pasteurized skim or low-fat milk to give it the acidic or sour flavour. Salt is also added to balance the flavour. Some dairies add flecks of butter to give it the yellowish colour. The fat content is 1%. Prev What is the difference between “short vatted” and “long-vatted” wines? Next What is Black Cumin Seed?